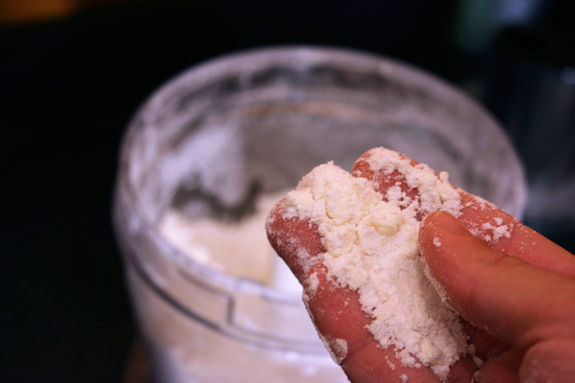 In a food processor process chilled butter and flour. Although a bit crumbly, push all the pieces together, wrap in plastic wrap and refrigerate. 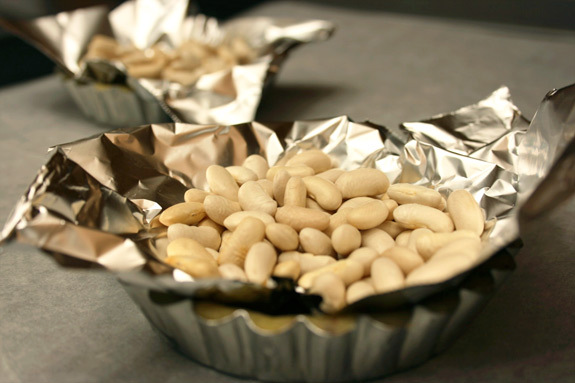 Once chilled roll out into tart mold, poke with a fork and cover with aluminum foil and weights (dry beans). Bake in a 400 degree F oven for 10 minutes. Uncover (remove beans) and bake until golden brown. 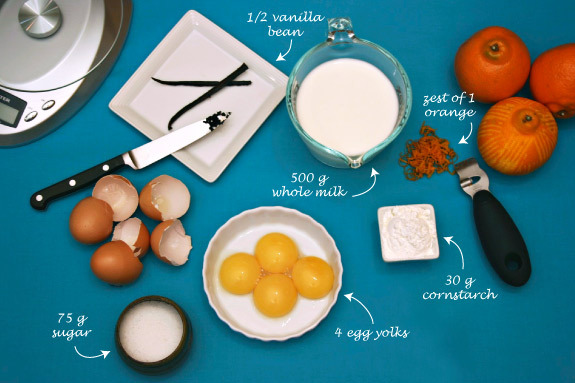 In a medium sized bowl, whisk together yolks, sugar, cornstarch, orange zest, vanilla bean and salt. Temper the yolks by slowly adding the hot milk to the yolk mixture while constantly whisking. Strain the yolk and milk mixture back into the small saucepan. Bring back to a boil over medium heat. Boil the cream for 1-2 minutes while whisking vigorously. Place the cooked cream into a clean bowl and chill it in an ice bath. Once sufficiently chilled, cover with plastic wrap and store in the fridge until ready to use. Notes:Make sure to whisk the cream at every step to avoid clumps. Stir the pastry cream occasionally while it’s sitting over the ice bath so that it cools evenly. This will also help produce a silky smooth cream. Fill each shell with pastry cream. Cover with assorted fruits (avoid watery fruits). To get that pretty glaze on top, mix a bit of water into some light colored jam and heat in the microwave until smooth. Glaze with a pastry brush and refrigerate until ready to eat. Notes: Do not assemble too ahead of time to avoid the crust from becoming soggy. Decisions, decisions… I was about to dig into this little tart with an equally little spoon, until I realized how portable they are. Needless to say, I put the spoon down and dug right in. Posted in desserts, French, recipe by Antonio Tahhan on August 2nd, 2008. You can follow any responses to this entry through the RSS 2.0 feed. You can leave a response, or trackback from your own site. I am so impressed by your blog. It is both beautiful and interesting. What a delicious combination! Simply fantastic! 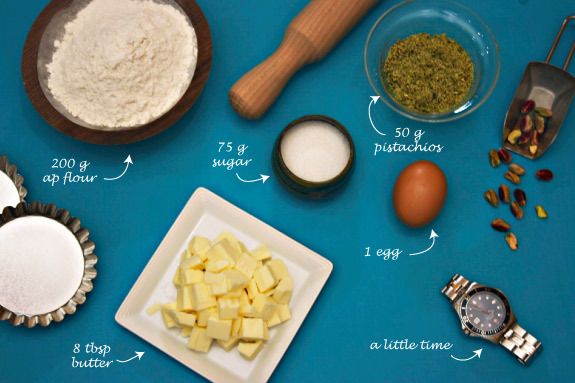 Pistachios are my favorite as you know – and so the dough here is just perfect. Actually I was planing on making a tart tomorrow too! You definitely upped the taste quotient by putting pistachios in the crust. 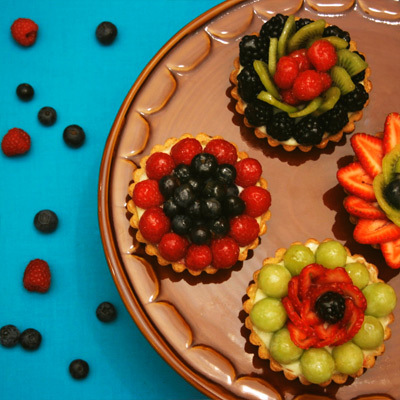 And, wow, those look better than the fruit tarts I see at cafes! Wow Tony, very impressive! This is on a long list of recipes to try despite seeming very scary. Does the bottom of your tartlette mold disconnect from the side of the mold? If not, did you have any trouble getting the tarts out of the mold? I’d never heard of blind baking before. Thanks for the lesson. OMG Tony, these looks AWESOME!!! I would love one for breakfast! Beautiful. 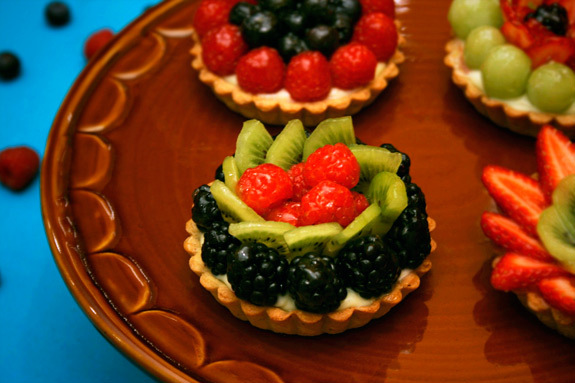 I love fruit tarts and yours are especially delicious looking. I love the pistachio in the crust. Katie – Thanks for stopping by! I also love finding new foodie bloggers – can’t wait to check out your blog! Christina – Yea, I really liked the look and taste that the pistachios brought to the table 🙂 decorating the tarts is so much fun, too! Psychgrad – Thanks! Oh, no… don’t be at all discouraged. I hoped that by separating them they would seem more approachable, but I know what you mean. Trust me, these are less intimidating than they look. Yes, the bottom of my tart molds do disconnect from the sides. And even if they didn’t, the dough has so much butter 🙂 that you shouldn’t have any trouble removing it after it is baked. HoneyB – I wish these little things travelled well, I would have sent you a few! Antonio ~ Thank you for thinking of the Kiwis and Aussies of the world that are drooling over your post. I, too, love to make a good “gussied up” shortcrust pastry. I often turn to almonds or spices, such as cinnamon or cardamom but will try pistachios, which I love inordinately but only think to use them for baklava or gelato. (Actually, I also add a little bit of lemon juice for extra flakiness.) The orange and almond infused pastry creams sound divine. 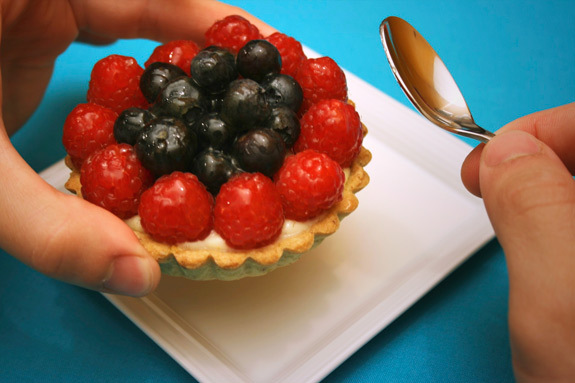 i need fruit tarts too … !!! these looks so gorgeous , pretty n colourful. And got such a fantastic variety of fruits n in there. I’m so tempted to lift one off the screen. Thanks for stopping by! I will definitely have to try the chili in my hot chocolate (or other concoctions) when there’s no one to delight/irk except for myself. 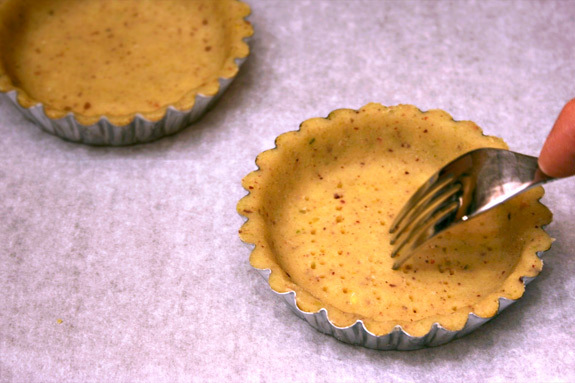 I love making tarts, especially because they’re so potable! I agree, you can’t go wrong with beautiful fruit. The orange infused cream sounds fabulous, I can’t wait to try it out. So glad to have found a new foodie blog to oogle at! I love your format. I am proud of you Tony, and I am sure your mom is proud too. What part of the Middle East are you from??? ?